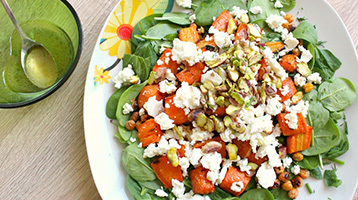 We want to provide you with information on how to create the ideal healthy salad! With endless amounts of ingredients available, some people can feel overwhelmed and unsure of what to put in a salad. If you have fresh, local ingredients on hand, you can easily turn your health around and create a delicious and filling salad for both lunch and/or dinner. The key is to always have vegetables at home and easily available to you. Just follow these guidelines below and you’ll be good to go! 5. Optional: choose 6 ounces of a meat (salmon, grilled chicken, flank steak) and/or your favorite kind of cheese to toss on top. That’s not all — spice up your simple salad with a fresh citrus fruit for an added flavor burst! Chop your favorite fruit and veggies and add to a bowl with all other ingredients — then your salad will be ready. Prep it the night before so you don’t have to do any work in the morning. Enjoy!